Perhaps many of us who've tried all sorts of existing PPC program, whether it is local or PPC programs PPC Program from outside. but finally we are return to the Adsense PPC, why? in our hearts must be wondering "why the bloggers are eager to be pubhliser Adsense, There are still a lot of PPC programs than Adsense? ", "What is the advantage of Google Adsense PPC which trigger the bloggers racing to join in?". I will try to answer this question. Many Advertiser install Google Adsense ads on their blogs, ads that appear so varied or diverse. Google Adsense ads also sometimes according to the theme of the blog or the contents of the articles we write, although sometimes the ads are not relevant to the content of the article but nonetheless very interesting display ads to visitors to click it. In Google Adsense value per click advertising or also called Cost per click (CPC), depending on the keywords that are existing on the article or on the website. the more expensive keywords attached, the more higher fee we will receive from each ad clicked, the source click is also an effect on any Adsense ad CPC value obtained for example, foreign click is usually higher than the click of a domestic (local). On the dashboard Adsense we can see our complete revenue every day, and we also get to see all the particulars about the source of the ad, ad click of sources and others. Why do I say this? because many other PPC does not pay their publishers when the balance is sufficient, but the Google Adsense real pay. 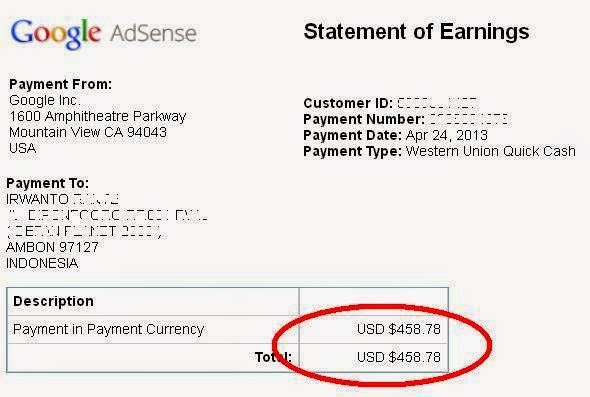 for example, I have a friend who has received his first paycheck from Google Adsense. So this is my formulation of the advantages of Google Adsense, if you have the advantage of others, please share it with other readers by commenting on the comments box below. I hope this article can be useful to the reader as well, forward and I will continue to write other the helpful articles from this hunger man.